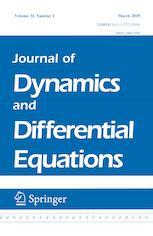 The Journal of Dynamics and Differential Equations answers the research needs of scholars of dynamical systems. It presents papers on the theory of the dynamics of differential equations (ordinary differential equations, partial differential equations, stochastic differential equations, and functional differential equations) and their discrete analogs. The journal also publishes papers dealing with computational results and applications in biology, engineering, physics, and the other sciences, as well as papers in other areas of mathematics which have direct bearing on the dynamics of differential equations. The dynamical issues treated in this journal cover all of the classical topics, including: attractors, bifurcation theory, connection theory, dichotomies, ergodic theory, finite and infinite dimensional systems, index theory, invariant manifolds, Lyapunov exponents, normal forms, singular perturbations, stability theory, symmetries, topological methods, and transversality. In addition, the journal covers new and emerging areas. Special emphasis is placed on papers dealing with high dimensional and/or infinite dimensional problems.